Meet Avalon. Avalon's teeth had been extracted a few months before. One of the extraction site sockets went through to the sinus. 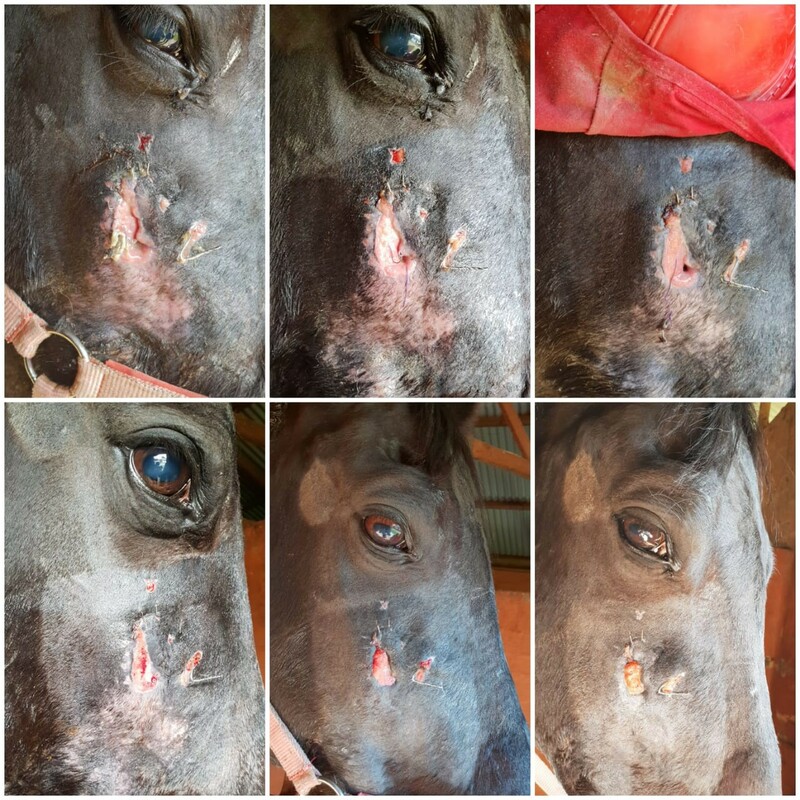 Vet used acrylic to plug the 'hole' and tied it in place with wire to the outside of the horse's face as a temporary solution to allow the bone to grow closed. The infection appeared to have spread into the sinus, then into the wound on the side of Avalon's face. Antibiotics were administered for a few months, but the infection was just getting worse. Photo's show wound immediately prior to treatment with Epic Diode 940nm Laser, then 72 hours later, final photo was day six, after 4 treatments. Treatment: Four treatments of biostimulation at approximately 12 Joules/cm2 on surface of wound per day, and 'Endo Setting' at 1,5 Watts CW using Endo Tip (200 micron-20mm) pushed into sinus cavity through 'hole' and slowly circled and withdrawn (10 seconds x 3). Prior to treatment, Avalon was not happy and very sullen. On day two, he was looking quite chirpy compared to days before according to his carers. On day three, Avalon was already firsky and wanted to play! Thank you for allowing SciVision to help Avalon with the power of light! The world leader in dental and medical lasers introduces its breakthrough 940 nanometer diode laser system to address canine and feline soft tissue procedures. BIOLASE’s groundbreaking 940 nm wavelength has been shown to be better absorbed by hemoglobin and oxyhemoglobin than other wavelengths. This means the Epic V-Series cuts faster at lower power, with less heat for greater comfort, faster healing and minimal trauma to the pet. 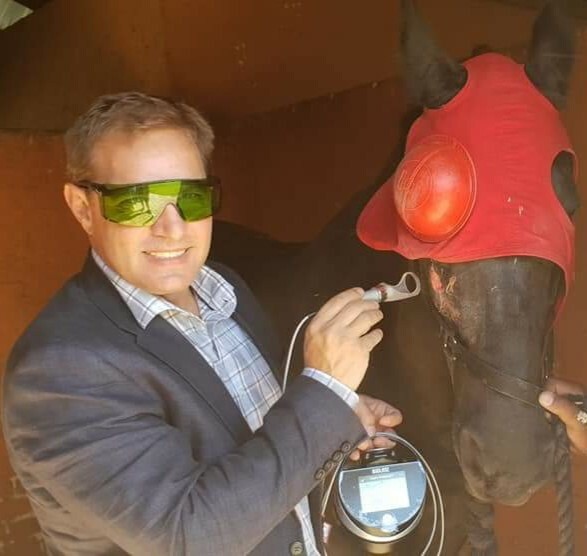 Plus, the Epic V-Series has 10 watts of peak power, with the shortest possible pulse of any veterinary laser device, for enhanced clinical results! 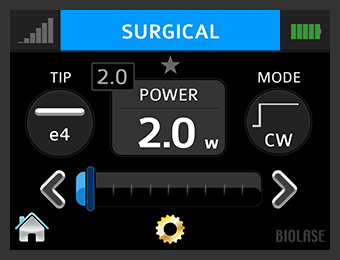 Epic offers the most precise control of tissue cutting for different procedures and tissue biotypes. 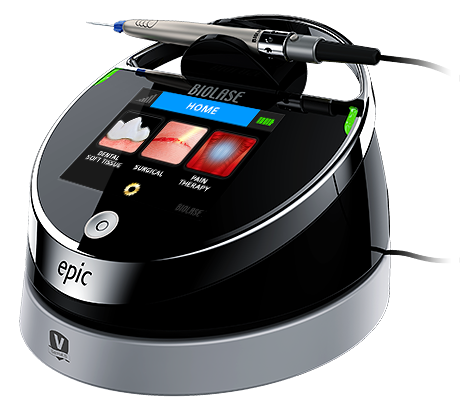 With our exclusive diode laser wavelength, Epic V-Series cuts soft tissue cleaner, with more hemostasis and supreme comfort. Take advantage of other soft tissue capabilities including relief of lesions as well as performing "pocket therapy" for periodontally challenged pets, using our proprietary, single-use disposable Perio tips. On top of the benefits of the 940nm wavelength, the Epic V-Series only weighs just 2.5 pounds – and with no power cords or footswitch cables to worry about, you can have total freedom to move around. A powerful Li-Ion battery pack ensures hours of use, allowing even greater flexibility during a busy day. One of the most promising aspects of laser dentistry is the opportunity to do more with less anesthetic, and less damage to the tissue. 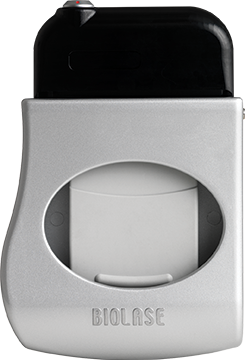 Epic V-Series delivers on that promise with ComfortPulse, a proprietary BIOLASE® innovation that delivers precisely controlled micropulses of diode energy to the tissue, followed by "down" time to allow tissue to respond positively. Older diode lasers rely on "stripping and cleaving" the fiber before each use. 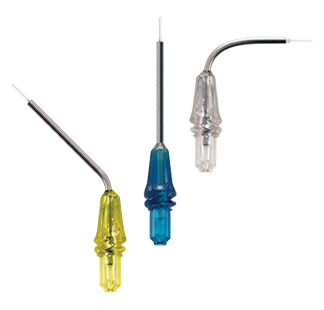 BIOLASE was the first to offer disposable single use tips for diode lasers – and we continue that tradition of convenience and ease of use for Epic V-Series. The system uses our full range of bendable tips for better access to all areas and all surgical indications, including periodontal procedures related to delivery Pocket Therapy for periodontally challenged pets.